The KD VI will release an Aunt Pearl for the third year in a row. The “Aunt Pearl” is a cancer awareness release that pays homage to Kevin Durant’s late aunt who lost her battle to lung cancer in 2000. Generally the KD Aunt Pearl is a very limited release selling out quick and only available at select locations. 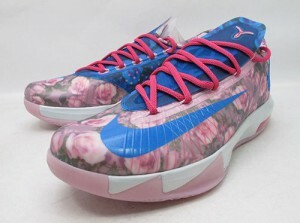 So far, only Foot Locker and Nike.com have confirmed they will carry the Aunt Pearl. Last year Foot Action and Eastbay also released the KD 5 Aunt Pearl, but have yet to announce they will release the KD 6 version. The release date is set for February 27th (2/27) at 8 AM with a KD Premium price tag of $150.